Mole Suddenly Raises! Is It Serious? Most Effective Ways to Lose Arm Fat! Facial flushing is a temporary redness localized in the face and neck. Sometimes facial flushing causes warm or tingling sensations in affected areas. Dilation of the blood vessels just beneath the surface of the skin causes facial flushing. This can occur for a variety of different reasons, including exercise or environmental heat, cosmetic conditions like rosacea or acne, medication or more serious condition like lupus. Exercise can increase your core temperature and naturally causes the dilation of capillaries to feed your tissues oxygen. Environmental heat or cold or changes in temperature can cause redness. Fever as seen in the common cold and the flu might result in facial redness. Alcohol ingestion can cause flushing, especially in the face and neck due to the thinning of blood. Medication side effects of calcium channel blockers, beta blockers nitrates, cyclosporine and others may result in flushing. Hormonal shifts as in pregnancy or menopause can have this effect. Strong emotion or arousal may release natural chemicals into the blood stream, making you red in the face. Histamine reaction as a result of exposure to an allergen either by ingestion or skin contact can cause facial flushing. Adult acne is a cosmetic cause of redness in the face. Rosacea is persistent and can result from other causes such as repeated incidences of mastocytosis. Mastocytosis is the build-up of mast cells in the body’s tissues, giving them a reddish appearance. Anaphylaxis is a severe life-threatening allergic reaction which may include flushing. Polycythemia is an increase of red blood cells. Lupus is an auto immune disease that may cause flushing. Carcinoid syndrome is the symptoms that sometimes accompany neuroendocrine tumors that release the hormones which are responsible for expected flushing. Facial flushing causes vary from expected to life threatening. However, facial flushing on its own is rarely indicative of anything serious. Serious conditions will manifest with other notable symptoms like diarrhea, chest pain, shortness of breath, or inflammation. These are not all of the possible symptoms, only some. 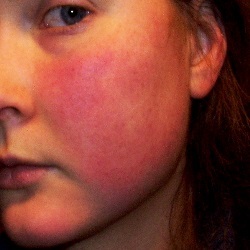 For common causes and recurring causes such as emotional or histamine reactions, the facial redness relief can be as simple as waiting for emotion or arousal has passed, using antihistamines (for common allergies that are not life threatening) and identifying the allergen and avoiding it whenever possible. Facial flushing that accompanies fever, exercise or exposure to heat can be helped by allowing yourself to cool and ensuring proper hydration. Cosmetic causes can be covered by makeup with a green base. You might ask your dermatologist for further suggestions. Medications can be adjusted by a physician to lessen the side effects and discomfort you experience. Do not adjust your medications on your own without physician instructions. You can also ask your doctor about taking your medicine with food to help combat these side effects. If a more serious cause of facial flushing is suspected, seek out medical attention. If a life threatening cause is suspected, seek out medical attention immediately. If facial redness relief cannot be achieved or the problem is recurring, it may indicate a more serious health condition that causes your facial flushing. However, it is important that common and cosmetic causes are ruled out before assuming serious causes. Making the distinction can save you time. Take note of any identifying characteristics of the redness such as shape, timing and duration and pass these on to your physician as they might be helpful in the diagnosing the cause of your facial redness. Symptoms that accompany your flushing will also help. Your doctor can often determine the underlying cause of your facial flushing with a physical exam and your medical history. However, some testing may become necessary.